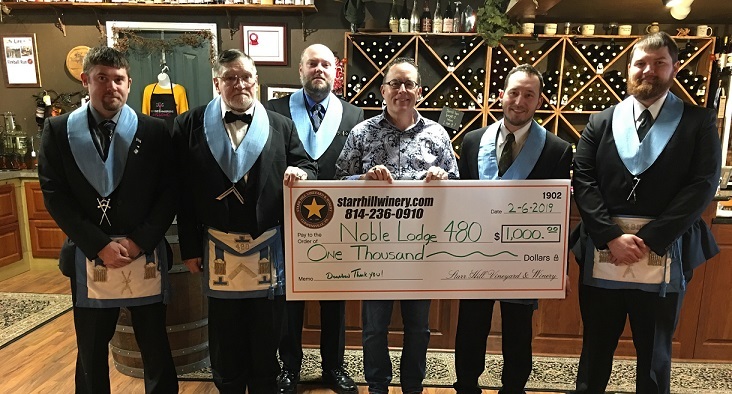 CURWENSVILLE – The Noble Lodge 480 Curwensville recently received a check from Kenn Starr, president of Starr Hill Vineyard & Winery. Pictured, from left to right, are: Jason Spencer, James Snyder, Adam Redden, Kenn Starr, Tony Starr and Nick Hullihen. The Noble Lodge, which was chartered Sept. 7, 1870 and for 149 years, has continued to help families and causes throughout Curwensville and surrounding areas. The annual Easter egg hunt will be held April 6 at 1 p.m., at the Noble Lodge No. 480, located on Lippert Street in Curwensville. It will be fun for all ages.